Version 1.2 of WEC-Sim is now available on GitHub, and there are lots of great updates! The NREL/SNL team is also implementing a multi-branch approach, allowing users to use the stable ‘master’ branch or the more advanced/under development ‘dev’ branch. WEC-Sim (Wave Energy Converter SIMulator) is an open source wave energy converter simulation tool being developed as a joint effort between the National Renewable Energy Laboratory (NREL) and Sandia National Laboratories (SNL) with funding from the U.S. Department of Energy’s Wind and Water Power Technologies Office. The code is developed in MATLAB/SIMULINK using the multi-body dynamics solver SimMechanics. 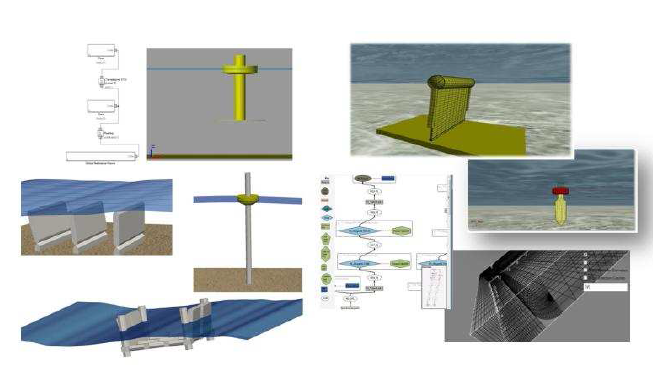 WEC-Sim has the ability to model devices that are comprised of rigid bodies, power-take-off systems, and mooring systems. Simulations are performed in the time-domain by solving the governing WEC equations of motion in 6 degrees-of-freedom as described in the WEC-Sim Theory Manual. The NREL/SNL team would like to receive feedback on how WEC-Sim can be improved in the future and to facilitate this process a questionnaire has been created. It is highly encouraged of all users to fill out the questionnaire as soon as possible. Thank you for your time and please direct any questions about the current release to Nathan Tom, Nathan.tom@nrel.gov.